Stinging nettle makes an almost iridescent emerald green tea that is very nutritious, mild and slightly grassy. Nettle leaves contain natural antihistamines and anti-inflammatories that open up constricted bronchial and nasal passages to ease hay fever and allergy symptoms. This herb is one of natures best nutraceuticals, containing protein, calcium, phosphorus, iron, magnesium, beta-carotene, along with vitamins A,C, D, and B complex, all in a form that is easy for the body to use. Use as a daily tonic for bone health. 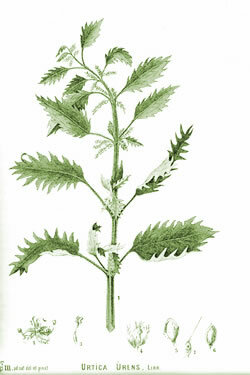 Recipe Instructions: Herbal Tea :Use two teaspoons of dried nettle leaves per pint of boiling water. increase to three to four teaspoons per pint for medicinal tea.